EXPOSED...7 Nutrition Lies That Are Keeping You Sick, Fat, and Frustrated! 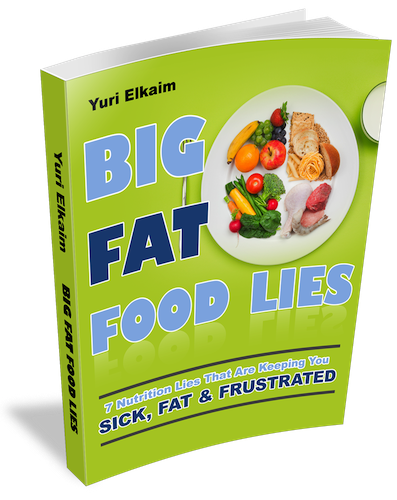 Rogue nutritionist, Yuri Elkaim, throws down the hammer and EXPOSES 7 nutrition lies that have been force-fed to you by big food conglomerates, the diet industry, shady experts, and a government gone wild! Finally, you can learn the TRUTH and start regaining control of your diet and health. The TRUTH about how much protein you really need…even if you want to build muscle (p. 8). This “awareness guide” is so important I refuse to charge for it. That’s why it’s yours absolutely FREE! Just tell me where to send it by entering your email to get FREE instant access to this controversial new report. CAUTION: This information is ONLY available for FREE for a few more days. Don’t get left behind. SImply enter your best email so I know where to send you this FREE consumer awareness guide. I hate spam as much as you. Your email will never be shared.